India launched its second navigation spacecraft aboard a Polar Satellite Launch Vehicle on Friday to continue building an independent space-based system to provide positioning services over Indian territory. The 144-foot-tall launcher lifted off at 1144 GMT (7:44 a.m. EDT) from the Satish Dhawan Space Center, India's primary space launch site on the country's eastern coastline about 50 miles north of Chennai. Propelled by a solid-fueled first stage and six strap-on motors, the PSLV raced into the sky from the Indian launch base, flying east while shedding all six boosters and the first stage in the first two minutes of the flight. The rocket's second stage Vikas engine ignited for two-and-a-half minutes to push the launcher into space, then the PSLV's third and fourth stages accelerated the mission's payload to orbital velocity. The upper stage released the Indian navigation satellite about 20 minutes after liftoff, prompting cheers and congratulatory handshakes in the launch control center. Preliminary data showed the rocket placed the spacecraft in an orbit with a high point of 12,807 miles, a low point of 176 miles and an inclination of 19.2 degrees. The parameters are close to prelaunch predictions. 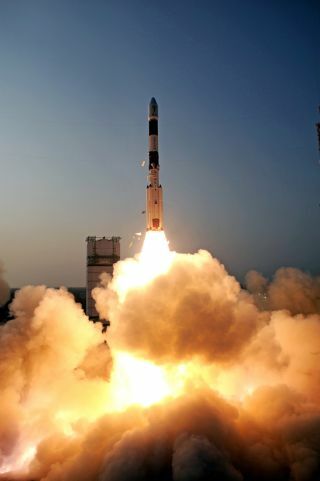 The launch marked the 26th PSLV mission since 1993 and the launcher's 22nd successful flight in a row. Friday's mission used the PSLV XL version of the workhorse launcher, the PSLV's most powerful configuration featuring enlarged boosters. The spacecraft is the second member of the Indian Regional Navigation Satellite System, a seven-satellite network flying in high-altitude orbits thousands of miles over the Indian Ocean. Weighing 3,157 pounds, or 1,432 kilograms, with a full load of propellant, the IRNSS 1B satellite will maneuver itself into a 22,300-mile-high geosynchronous orbit at 55 degrees east longitude with an inclination of 29 degrees to the equator. The satellite will drift north and south of the equator, tracing a "figure-eight" pattern over the Indian Ocean, Arabian Sea and South Asia. Designed for a 10-year lifetime, IRNSS 1B joins the navigation system's first satellite launched in July 2013. Five more Indian navigation spacecraft are scheduled for launch by mid-2015. The program's positioning services will reach users in India and surrounding regions extending about 900 miles from the Indian mainland. IRNSS services will be freely available to the public, but some capabilities will be restricted to government users, officials said. IRNSS 1B carries L-band and S-band navigation payloads and a rubidium atomic clock to keep time. A C-band transponder and laser reflectors will help engineers determine the distance to the satellite in orbit, a requirement for precise navigation services. Four IRNSS satellites will operate in inclined geosynchronous orbits like IRNSS 1A and 1B, while three spacecraft will launch into geostationary orbit over the equator. Indian officials say the independent navigation service will aid marine traffic, emergency response officials, vehicle tracking applications, mobile communications, mapping, and civilian drivers.